Stylish and attractive, this dinner plate will make a lovely addition to your dinnerware collection. It comes in a print pattern that renders it classy while the use of high quality material lends it a refined look. 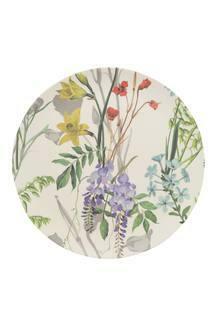 You can use this round plate for serving dinner to your guests. Add a dash of style to your dinnerware collection and enrich your dining experience with this dinner plate by Back to Earth.